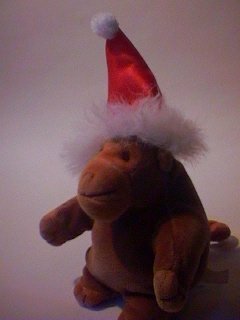 *Mr Monkey would like it to be known that certain people prevent him wearing his excellent Christmas hat as often as he would like, and he wishes it could be Christmas every day. Mr Monkey has been listening to supermarket muzak too much. 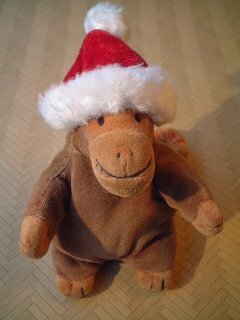 Mr Monkey's new Christmas hat was originally owned by a disturbingly bizarre Santa Claus head attached to a knitted stocking. Mr Monkey's older Christmas hat (on the right) was acquired by an act of violence against an evil wooden puppet.